144 Rolls (i.e. 4 boxes of 36 rolls) of standard clear packing tape 48mm x 66M. These are industrial length 66 metre rolls. 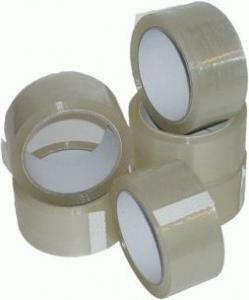 Standard polyprop tape for light business use. If you are looking for stronger clear tape, we would recommend the cellofix branded low noise versions, which we distribute into most warehouse/manufacturing businesses that we deal with.